In 1936, a disgraced academic leads a team to an Egyptian pyramid in search of great secrets. Accompanied by an acclaimed Hollywood director and a wandering former cowboy, they trigger an ancient trap, and find themselves lost in a world of marvels. Dinosaurs, Amazons, and creatures too strange for modern science coexist side-by-side, and all are threatened by a darkness spreading from the surface world. As new allies are discovered, and fearsome enemies made, will these pulp adventurers live long enough to escape the dangers of the Hollow Earth? 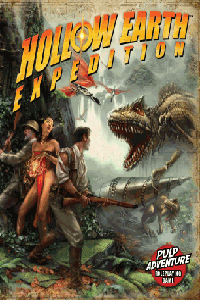 Hollow Earth Expedition is published by Exile Game Studio. Support Fandible by purchasing through one of the links below.